This must be one of the most exciting visions of the prophet Ezekiel. It is a vision for today’s society and church. Barrenness – vs. 1, 2 – The prophet surveys the land. Before him is a vision of dry bones. These bones litter a battle ground where the defeated lie. What a symbol for modern life. Oration – v. 3 – As God speaks the prophet is to speak. Yes, he is to speak words at the command of God in the face of devastation. 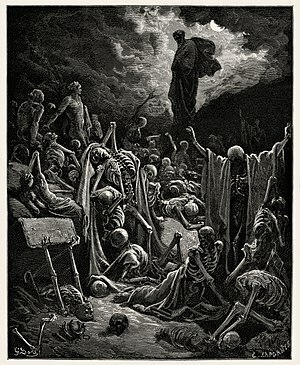 Necromancy – vs. 4-7 – In the Old Testament there is a law against necromancy. We humans are not given the authority to speak to the dead. Yet the prophet is to speak, and through him God is calling to the dead. Embodiment – v. 8 – The word of God and the command of God can bring life where there was no life and restore life. On the third day we remember God raised Jesus from the dead. Spirit – v. 9 – How many souls are alive in body and yet lifeless. It is the spirit that they need. So often it is the spirit that the Church needs to enliven its dead bones. Let God breathe life into body and church. Exemplary story: The strange scene before Ezekiel is commemorated in the words of an old spiritual. “Dem bones, dem bones ‘gonna rise again.” Where the Spirit of the Lord is there is life. Wheels 1:15,16 Ever notice how often the calling of a prophet is preceded by the coming of an angel. Holy One 1:26-28 The most awesome part of the vision is the Lord seated on a throne and surrounded by an unearthly corona. Installation 2:1,3 It is not the angels that must carry the word. 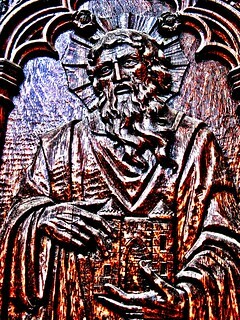 It is a humble human, a prophet like you and I.
Luminary Word 2:5,6 The message is the word that gives grace and glory. Ezekiel saw the wheel way up in the middle of the air. Now Ezekiel saw the wheel in a wheel, way up in the middle of the air. Chorus: And the big wheel run by faith, good Lordy, and the little wheel run by the grace of God; in the wheel in the wheel in the wheel good Lordy; way in the middle of the air.